In Amy Dickinson’s advice column of 4/5/17, she published a letter which serves as a good, simple and straightforward illustration of something I call the principle of opposite behaviors, described in several previous posts, as well as illustrating how seemingly opposite behaviors are actually just two sides of the same ambivalent coin. The principle states that completely opposite behavior patterns can lead to the exact same result. If you’re afraid of being dependent on others, you can refuse to let anyone help you with anything. Or you can ask for way too much, annoying and eventually driving off people who might want to help you. In either case, you will end up with no help!This principle comes into play when someone is ambivalent about certain rules of behavior in specific social situations. If this ambivalence is pervasive and frequently seen as a problem, said people who exhibited it were once called neurotics. The psychoanalysts who were the first to describe intrapsychic conflicts as a phenomenon missed the fact that these conflicts were usually shared by all the members of their patients’ entire family. In some cases, the conflict is expressed by compulsive or polarized behavior at one end of the spectrum - or at the exact opposite end. Some highly ambivalent people go back and forth between the two extremes, while in other cases, one generation goes to one extreme, the next to the other, and the third back to the first one.In the letter, the father in the family was ambivalent how involved he should be with his son, and his conflictual behavior became apparent at his son’s little league games. His behavior was polarized and seemingly the exact opposite of that of his father. Amy’s answer points out that trying not to be like your own parents in some way that you didn’t like can lead to a situation in which you try to do the exact opposite – and get the exact same result. Here, in abbreviated form, is the letter and the relevant response.Dear Amy: ...when we go to our son’s Little League games…my husband is the loud one on the sidelines — pacing, swearing and turning red; he micromanages our son, and shouts belittling comments at him and other kids on our team. He argues with the umpires, and complains about the coaches… he has been ejected from games during those seasons. 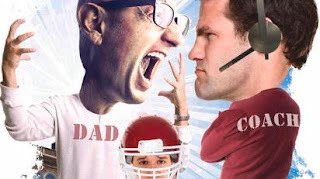 I’ve tried asking him to be calmer...He says that he’s a lot better than his own dad, who never showed up for anything…Dear Exhausted: Your husband claims that he is “better” than his own father was, but how is getting ejected from a game better than not showing up for the game? Either way, Dad is not at the game!